Upon landing in Lulea, you’ll be met by our expert guide who will have you transferred to Brando. Here you’ll be handed that all-important arctic clothing and receive a snowmobile briefing. When you’re wrapped up and ready to brave the cold, it’s time to drive yourself over to Pine Bay Lodge for the first leg of your frozen adventure. Pine Bay Lodge teeters on the coastal edge of the Luleå Archipelago, an archipelago made up of 1300 islands and home to as little as 100 residents. The sea around these islands freezes up to a metre thick in winter, so you can just imagine the spectacular views that surround this bolthole. Relax in the warmth of the sauna or beside the homely fireplace in this stunning traditional Swedish cottage before setting off on a walk to try and catch a glimpse of the Northern Lights. Don’t worry if you don’t see them first time round; we’ll have you back out there on Northern Light watch most evenings. After a delicious breakfast to set you up for the day ahead, its back on that snowmobile and time for you to embark on a four hour pack ice adventure out on the frozen seas of this incredible archipelago. You’ll stop midway for some hot drinks and a chance to try your hand at ice fishing, a fun and unique experience (even if you don’t consider yourself to be quite the angler). The end destination of your pack ice adventure is the island of Brändöskar in the outermost archipelago. Here you’ll have uninterrupted views over the frozen bay of Bothnia, views that are sure to take your breath away. After returning to the mainland and an hour’s drive north, you’ve arrived in the forest lands where you’ll be met by another local guide and taken to the Aurora Safari Camp. Yep, camping in snowy Sweden. Don’t worry though; you’ll be staying in a luxurious and cosy Luvvu tent. Equipped with a comfortable bed, arctic sleeping bag and a heater to keep you snug (we’d never let you freeze), you’ll be comfortable and warm in the midst of this magical forest. After a night in this atmospheric hideaway, we’ll have you checked in to the nearby Sorbyn Lodge which is located on a gorgeous lake near the small village of Sörbyn (as you may have guessed). Indulge in a spot of lunch here (the hotel’s restaurant is renowned locally for its quality of food that incorporates local ingredients) before heading out on your next adventure – Dogsledding. Exploring the landscape with a team of pure bred Siberian Huskies is a must when in Sweden and nothing quite compares to being drawn along as the huskies race through the untouched powder snow that stretches for as far as the eye can see. If this isn’t already shaping up to be a perfect day out, we’ll arrange for you another expedition to catch the Northern Lights. After dinner at the Sörbyn Lodge, a guide will take you on a four hour Northern Lights safari, and if you see them (fingers crossed), you’ll be completely mesmerised. It truly is one of nature’s most spectacular displays. We’re pretty sure there’s no better way to get under the skin of a destination than by learning from the people that know it best; the locals. So, we’ll have you visiting a Sami family to spend a day learning about their way of life out in this wilderness. The Sami people are the Indigenous people of Scandinavia, inhabiting the arctic area of Sapmi, which encompasses parts of far Northern Norway, Sweden, Finland and the Kola Peninsula of Russia. Greater measures are now in place to protect and learn from the Sami, so make the most of this unique insight into traditional Scandinavian culture. 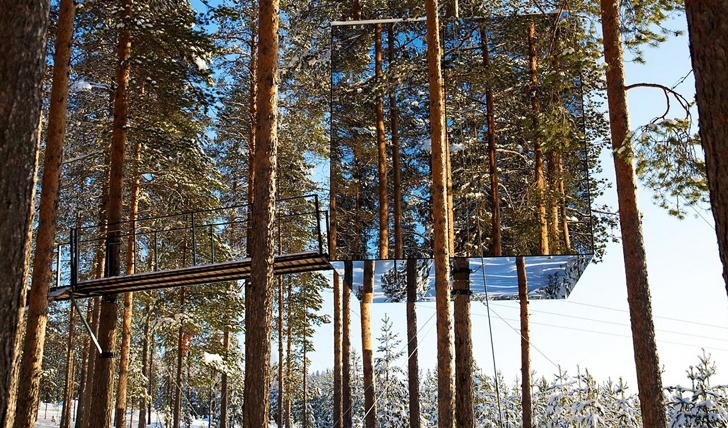 Your final stop on this snowy adventure is The Treehotel. This unique and exciting hotel offers tree rooms that are suspended in the midst of unspoiled nature. From these unique rooms (they come in the form of a bird’s nest, a UFO or a mirror cube) you’ll gain uninterrupted views over the Lule River valley and the miles of forest that spread out before you. After a night to remember at this one-of-a-kind hotel, it’s time to begin the journey back to the airport. We’ve arranged one last stop, however. 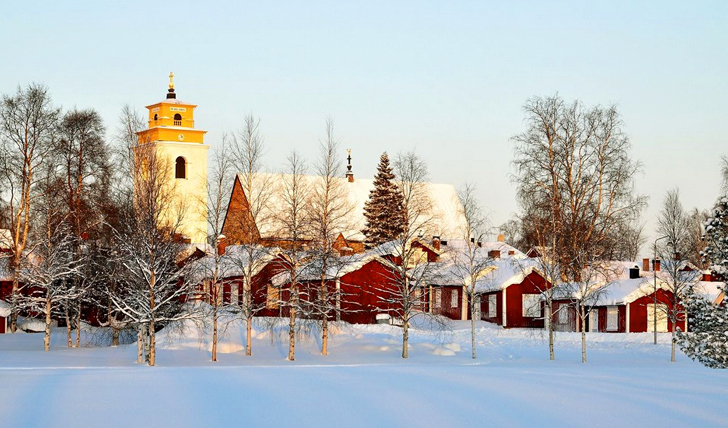 The Gammelstad Church Village is a listed World Heritage site and the 424 red painted, wooden buildings that present a stunning backdrop to the 15th century stone Church never fail to impress. The dusting of snow settling on the rooftops here presents you with a perfect last view of Sweden before you set off back home from Luleå Airport. A truly charming destination, this is one trip you’ll not be forgetting in a hurry.